How to live to be one hundred and love it! There are many areas of the world where there are many , living to be 100 or more. These people are known to be living in ‘blue zones’, meaning that these zones are areas of the world where people live healthier and longer lives, compared to the rest of the world. There’s a tiny Mediterranean island in Greece called Ikaria where people typically live a very long life. It is in the central Aegean and is off the coast of Turkey. It has been isolated from the rest of ancient Greece and that of modern Greece as well. The island has been known as a health destination dating back 25 centuries, when Greek travelers went to the island to soak in the hot springs near Therma. It has been said that people on this island just ‘forget to die’. So how do the people of Ikaria live so long? It appears to be a combination of factors – simple and inexpensive plant based diet, exercise, laughter, socializing, and faith. Medical science has stated their beliefs for some time that only 25% of longevity is determined by genetics. It has been stated that 75% of our longevity is determined by how and where you live. Interestingly, it has been discovered that the rate of Alzheimer’s and dementia in Ikaria has been shown to be one-fifth of that in America. The mode of transportation for the people of Ikaria is by foot, and their physical activity keeps their metabolism high. Many residents kneed bread by hand. Many 90 year-olds walk five miles a day to tend their goats. They have a simple plant-based Mediterranean diet that includes fresh fruits and vegetables from their gardens, beans, legumes, potatoes, greens (called horta), fish and olive oil. The artificial sugars or sweeteners that are so prevalent in the American diet do not exist in their foods that they get from their own gardens. They also love their herbs and herbal Greek remedies. Most of these remedies consist of wild rosemary, sage and oregano. Scientists have found these teas to be good antioxidants and some of these teas also act as a diuretic, keeping blood pressure stable by ridding the body of extra sodium and water. There are also local ‘mountain teas’ with wild marjoram, with dandelion leaves or lemon. Their teas are their medicine, and they frequently use honey for medicinal purposes as well. So what are the longevity factors in Ikaria? One is the geography. Residents appear to live well in the clean air and warm climate and hilly terrain that predisposes the people to walk a lot. There is also the lifestyle factor. 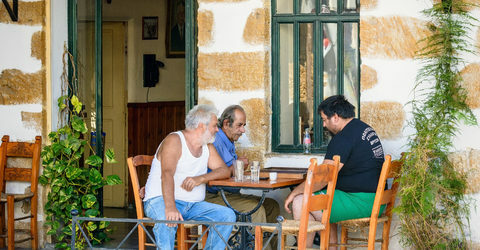 Residents of Ikaria live a more relaxed lifestyle – taking frequent naps, drinking wine, and socializing into the night with family and friends. They don’t live by the clock and they live in their own pace of life – a more easygoing and unstressed one at that. They have culture and traditions that are set apart from other areas of the world, and family values are very important to them. Socialization is important to residents and they have developed a sense of belonging and purpose that is key to their longevity. Community involvement adds to their comfort and happiness. Additionally, exercise is one of the more important factors, and it has been said that a resident can walk up 20 hills a day, and if they are not walking, they are dancing among family or friends. Residents also walk when they tend their food gardens, and they are healthier by growing and eating their own foods. Finally, many residents are faith filled Christians and go to church and pray as well. What can we learn from the people of Ikaria? Can we live longer if we follow in their footsteps? Well, the Mediterranean style diet has been recommended in the United States for quite some time for those individuals seeking a healthier life. That would include more fruits, vegetables, whole grains, beans and olive oil. The olive oil is known for its cholesterol-lowering and mono-unsaturated fats. Also goat milk, which is popular in Ikaria, is a good source of calcium, potassium and has a stress-relieving hormone called tryptophan. Even those who are lactose intolerant can usually tolerate goat’s milk. We could also learn from these people’s active and resting lifestyles. They tend their gardens, walk their goats, visit their neighbors and tend their own yards. They have lives of movement. However, they also nap regularly, and studies show that people who nap regularly have up to a 35% lower chance of dying from heart disease. Napping has been known to lower stress hormones as well. Further, the people of Ikaria have been known to be avid Greek Orthodox Christians. While their religion does call for some fasting, it also calls for prayer and faith. So we can see that a combination of factors predisposes the people of Ikaria to live to be 100 years of age or older. We can also see how socialization and a sense of belonging is a key factor in the health and longevity of these island people.